Within the not-so-friendly confines of the modern music industry, making good music often isn’t enough. It seems that being prolific and learning how to market one’s self are almost equally important, as there’s always something new over the horizon to take hold of our limited attention spans and distract us from something possibly more worthy. Illogic and Blockhead have traditionally been the type of artists to focus on tightly crafted albums rather than one off projects and mixtapes, and thus haven’t had to release music at the rate the modern music fan is becoming accustomed to. The large amount of music they have recorded over the last couple years though, has allowed them to promote their upcoming album Capture The Sun with a series of EP’s and videos, keeping their name out there and making sure their full length LP will get the proper attention without sacrificing quality for quantity’s sake. 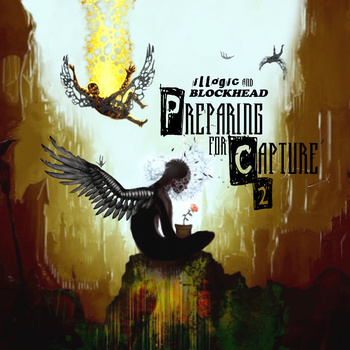 Not only have Illogic and Blockhead’s promotion and presentation been excellent for the previously featured Preparing for Capture EP and the newly released Preparing for Capture 2, but the music’s been pretty darn good as well. While the first EP was more contemplative and introspective in tone (in both Illogic’s rhymes and Blockhead’s beats), Preparing for Capture 2 has a raw edge to it that’s not really the norm for either artist. Blockhead’s beats thump particularly hard, but maintain his excellent use of texture shifts and subtle ambient touches. The three song run of “A Mile From Dead”, “Uncharted Path”, and “Wing Span” is a perfect example of why Blockhead is one of the best hip hop producers around. It’s not the instruments or sounds he samples, but the way he arranges them and makes the compositions his own that truly sets him apart. All three songs have similar elements, but each has its own unique feel and rhythm that always keeps his production fresh. Illogic’s rhymes on Preparing for Capture 2 find him playing the role of observer more often than not and sounding more than comfortable over Blockhead’s up-tempo production. Illogic hinted in an excellent interview he and Blockhead did with Hardwood Blacktop that the EP was a little darker and more political in nature, which explains my sense that the outside world was his primary inspiration for the majority of these songs. “Dreamin” serves as the lead single and speaks on the economic machination of the world, featuring top notch wordplay from Illogic- “they got us burning books and Kindle Firing” (video). “Heartless” and “A Mile From Dead” are especially sharp lyrically, the prior taking people to task for materialism and a lack of compassion “you got your favorite cardigan, but tell me where your heart has been” and the latter serving as a calling for people to strive for a better life and to defy expectations and stereotypes. Just like the first EP, which featured a stellar appearance from Rob Sonic, the guests are kept to a minimum on Preparing for Capture 2. Thoughts on Tracks favorite Open Mike Eagle and Has-Lo are the lone guests on the posse cut “From Scratch” and both deliver standout verses. Illogic ends the EP with the killer song “Past/Future”, tabbing Matisha Worthy to sing the hook. He uses the first verse to look back on his life to this point and the second verse to look towards the future. It’s a fitting way to end the EP, as the future looks very bright with Capture The Sun on the way. Listen to the release below. Name your price for a digital download or pick up a physical copy of Preparing For Capture via Bandcamp.